My friends... I am obsessed with office and desk supplies. I think this sickness began when I was a teacher. There is just something so thrilling about a new package of pencils... a stack of paper... full of possibilities. I ran across this little cutie a few days ago and it now graces my desk top. How cute is this!! Isn't this a great way to store paper clips? 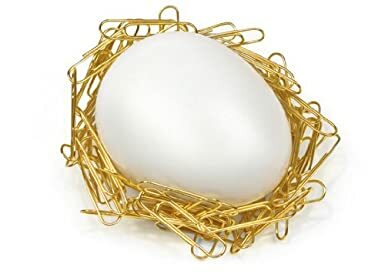 The egg is magnetic so the clips stick to it, making a little nest. Makes me smile every time I look at it. I keep expecting it to hatch out a gold chick or something.